Vancouver Canucks fans were given an exceptional memory at the end of last season when franchise icons Daniel and Henrik Sedin played in their final game at home. The two combined for two goals and two assists—split just as you’d imagine between the twins, with Daniel scoring both—including the game-winner in overtime, and on the powerplay no less. The two would skate several laps around the rink to say farewell to their city and fan base, before eventually officially announcing their retirement at the conclusion of the season. Daniel and Henrik are a big part of this community. They’ve given back so much, I mean they’re just iconic players. Iconic players and iconic people, they’re just amazing. So we’re going to really do something special for them, and it’s not just going to be one night, it could be like a week’s long festivities. The Sedin twins were the faces (or is it just face?) of the Canucks franchise for nearly two decades following the draft floor magic that then-GM Brian Burke worked to secure both of them. Selected second and third overall in 1999, they finished with nearly identical career point totals—though accomplished in different ways—and each won an Art Ross Trophy as the league’s highest scorer. Interestingly, only Henrik won a Hart Trophy as league MVP and only Daniel won a Lester B. Pearson Award (now Ted Lindsay Award) as Most Outstanding Player as voted by his peers. Inseparable both on the ice and in any hockey fan’s memory, they’ll see #22 and #33 go up to the rafters together next season. Based purely on salary versus what he brings to the table, Jori Lehtera’s $4.7MM contract is the worst on the Flyers. However, Philadelphia is far from cap trouble this season, currently among the five lightest payrolls in the league, and Lehtera’s deal expires after this season. However, next year the Flyers will need to re-sign or replace Wayne Simmonds, hand new deals to Ivan Provorov and Travis Konecny, and likely find a new starting goalie. The cap crunch will be much more real and the over-inflated $5MM contract of Andrew MacDonald will hurt. MacDonald’s six-year, $30MM contract was immediately panned by the public and it wasn’t long after that he was buried in the minors for cap relief and to keep him out of the lineup. MacDonald simply is not the player he was with the New York Islanders earlier in his career when he could eat major minutes, was stellar in man-to-man defense, and could block shots with the best. What he is being paid now is far beyond what he is actually worth. Some would say that Radko Gudas is worse, but that is an argument that suffers from recency bias. Combining the past two seasons, Gudas actually has the same amount of points as MacDonald in fewer games and less ice time, a better plus/minus rating, far more shots, and of course infinitely more hits. At $3.35MM for the next two years, Gudas is a far better deal. The real answer is that GM Jim Rutherford would not like to trade any more players. He already ditched two of his worst contracts by sending Matt Hunwick and Conor Sheary to the Buffalo Sabres and he isn’t eager to make another salary dump. However, the reality is that Rutherford is going to find it hard to manipulate his roster this season with just over $1MM in cap space. As such, it is likely that another Penguin could be on the move. An outside observer could easily point to the Jack Johnson contract as one that stands little chance of maintaining its value over the term and the same argument could be made for Patric Hornqvist as well. However, Rutherford just signed those deals and wouldn’t move them even if he could. That leaves a short list of players who could be moved and the only one that sticks out as being overpriced is Carl Hagelin. Hagelin has played an important part of the Penguins’ reign over the past few years, but at $4MM he has not cracked 40 points in any of the three seasons and can go cold for weeks at a time. Rutherford won’t make a move unless it can benefit the team, but if he can get another scoring winger in exchange for a package that dumps Hagelin’s salary, he’ll do it. Mikkel Boedker, Joel Ward, and Paul Martin are all gone. Two top forwards, the two best defensemen, and the starting goalie are all locked up long-term at a reasonable rate. The Sharks have almost $4.5MM in cap space this season, giving them room to add. Congratulations to GM Doug Wilson and his staff. This roster is the epitome of cap compliance mixed with depth and talent. There is not one contract that the team would be interested in dumping. The Blues currently have all but $285K of their cap space committed to 24 players. The team may send Chris Thorburn or Jordan Nolan down to the AHL, but will only gain marginal space. Something else has to give. If they could target any player to move to alleviate some pressure, it would be Alexander Steen. With just seven forwards and three defensemen (as of now) signed beyond next season and the majority of players in line for raises or free agent replacements, these cap woes aren’t going away anytime soon and an expensive long-term deal needs to be shipped out. Understandably, St. Louis is all in this season and wouldn’t be eager to ship out an important top-six piece. However, Ryan O’Reilly, Vladimir Tarasenko, Brayden Schenn, and Jaden Schwartz are the new young core up front now and paying 34-year-old Steen $5.75MM for three more years for declining production just doesn’t make sense. The Blues could potentially land some nice pieces from another contender for Steen as well. Admittedly, the Tyler Bozak contract looks even worse than Steen’s, but the Blues won’t be looking to trade a player they just signed. The long-term implications of several other deals aside, the Lightning’s Stanley Cup window is wide open and their focus is on the here and now. The one player really impeding their ability to add freely to the roster is Ryan Callahan. While GM Steve Yzerman has excelled at extending most of his core below market value, the six-year, $34.8MM contract for Callahan was a mistake. Injuries limited Callahan to just 18 games in 2016-17, but last year he played in 67 games yet he only managed to score 18 points. Callahan’s days as an impact player are over, but he is still being paid like one at $5.8MM. While Tampa Bay can manage this season with close to $3MM in cap space, they would have more to work with without him. However, Callahan’s contract will really present a major road block next summer, when the Bolts need to re-sign Brayden Point, Yanni Gourde, Anton Stralman, and more. There is no doubt that Yzerman will look to unload Callahan’s contract before it comes to that point. The Maple Leafs severely jumped the gun when they rewarded Nikita Zaitsev with a seven-year deal after his rookie season in 2016-17. Although Zaitsev was an import, making his NHL debut at 25 years old, his situation epitomizes why bridge deals exist. Toronto sought to lock him up long term and gave him nearly a maximum term at $4.5MM, just $500K less per year than top defender Morgan Rielly. In his encore performance last season, he showed that he is not worthy of the salary nor length of that contract, dropping from 36 points to 13 points for the year, turning the puck over at an alarming rate, and eventually becoming a healthy scratch. This team simply can’t afford the type of long-term mistake that they made with Zaitsev. While it’s nice that they have Reilly, John Tavares, and Nazem Kadri signed long-term, it’s Auston Matthews, Mitch Marner, and William Nylander they need to worry about. The Maple Leafs will have to balance multiple expensive, long-term deals moving forward and would love for Zaitsev’s to not be one of them. It seems unlikely that the recently-signed deals for Jay Beagle and Antoine Roussel will work out well, but they at least deserve some time. Loui Eriksson has had his time and has done nothing with it. 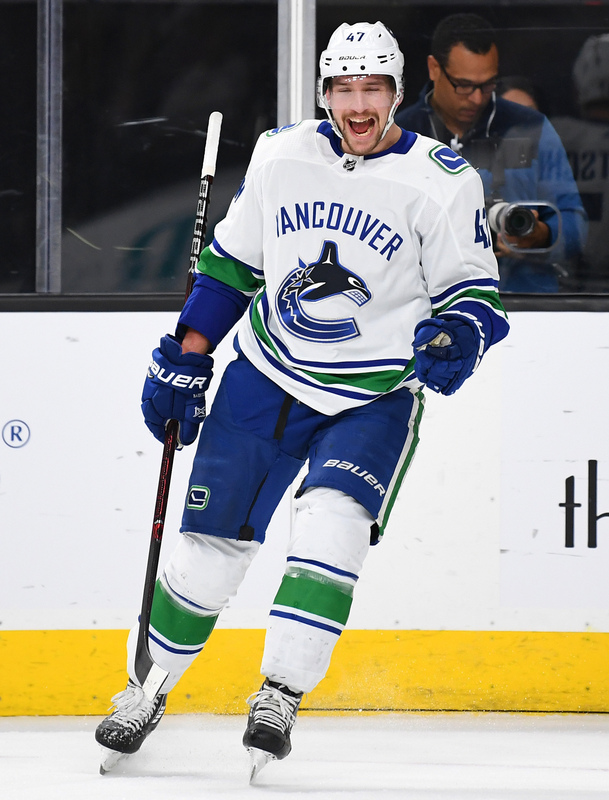 While the Canucks aren’t under any cap pressure, they can’t enjoy seeing Eriksson’s $6MM cap hit – the highest on the team – on the books for four more years, especially when the bulk of his front-loaded salary has already been paid out. Eriksson was brought in with an expectation that he would be the ultimate fit with Daniel and Henrik Sedin. Instead, he has scored just 47 points combined over two seasons, less than his final season total with the Boston Bruins. The Sedins are now gone, the team is trying to get both younger and more physical and defensive-minded, and Eriksson is simply an expensive poor fit. There’s not much more to say about a player who desperately needs a change of scenery and a team that wants him gone. The Golden Knights are riding high after an outrageously successful first season in the NHL. It is highly unlikely that they see anything wrong with their current contracts, almost all of which were either hand-picked or signed by GM George McPhee. Give it some time and that could change. Reilly Smith is notorious for a significant drop in production in his second year with a team, but is signed for four more years at $5MM. Paul Stastny for three years at $6.5MM per seems like a solid deal, but he has always produced better surrounded by equal talent. Does Vegas have enough to justify his signing? A $2.775MM cap hit for Ryan Reaves doesn’t seem to make a whole lot of sense. Finally, there’s the three-year, $21MM extension for heroic goalie but also 33-year-old well-worn vet Marc-Andre Fleury, which could end poorly. And this isn’t even counting what could be a massive reactionary contract for one-year breakout star William Karlsson. The Knights don’t see any problems right now after finding immediate success, but if they slide significantly in year two, things could get ugly. No, it’s not Tom Wilson. The call of the question is which contract each team wants to trade, not which is objectively the worst. Wilson’s contract does seem excessive, but he is just 24 and could grow into that salary (doubtful but possible). Plus, the organization loves what he brings to the team. T.J. Oshie on the other hand is heading in the wrong direction. Oshie has done what he was brought in to do: help the Capitals win the Stanley Cup. It took a max eight-year term to keep Oshie off the market last summer and now Washington has their Cup but also has a 31-year-old with diminishing returns signed for seven more years. Oshie could absolutely still help the Capitals over the next few years, but it’s doubtful that he will be back in 60-point range in that time. He also will be nothing more than a cap space vacuum when he’s in his late thirties making $5.75MM. Oshie is a great player and one of the more likeable guys in the league, but this contract has little upside left. The Capitals would at the very least consider trading Oshie now, which can’t be said for most of their other core players. The list ends with a tricky one. Is $5.5MM a fair value for Trouba? An arbitrator thinks so and the Jets would likely agree. However, Trouba’s contract has been a nightmare for the team. The young defenseman clearly does not want to be in Winnipeg and has set himself up for yet another arbitration clash next summer, after which he will bolt in free agency. The Jets have no long-term security with Trouba and that meddles with their future planning. With Blake Wheeler, Tyler Myers, and several others also in need of new contracts next summer, the Jets don’t need another Trouba arbitration award cutting into their cap space just so that he can walk after the season. The team will definitely look to get maximum value in a trade for Trouba over the next season. The Vancouver Canucks dealt with a lot of criticism when free agency started last week when they went out and signed bottom-six players Jay Beagle, Antoine Roussel and Tim Schaller to long-term deals (Beagle & Roussel got four years, while Schaller signed for two). While the general addition of these three players was to add some size, grit and leadership to an incredibly young team, there is another key advantage of bringing in those three, especially with their abilities to help with penalty killing. Both Beagle and Schaller were solid contributors to their teams last season on the penalty kill and they both will bring those skills to Vancouver now. The hope is that Beagle and Schaller should improve the team’s 21st-ranked penalty killing unit, which must improve dramatically if the team wants to start winning. However, their signings also have another key importance to the team. Perhaps more than anyone, the most likely benefactor to these signings will be center Bo Horvat, who has always been forced to take penalty killing minutes in the past as part of his responsibilities. However with the retirement of Henrik Sedin, suddenly Horvat’s responsibilities have changed, according to Jason Botchford of the Vancouver Sun. The team needs more scoring without the Sedin twins and the team will turn to their four-year pro to take his game to that next level and reducing his minutes on the penalty kill should only help him carry that out. Horvat’s numbers have been solid, but now that he’s likely moving into the No. 1 center position, he must continue to improve. The 23-year-old has increased his scoring over the past four years, going from 14 goals in his rookie campaign, to 16, then 20 and this year posting 22 goals, even though he played in the least amount of games in his career (64). 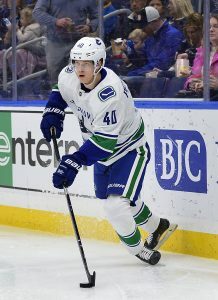 That grit created by Beagle and Roussel especially should benefit someone like Elias Pettersson, who the team hopes will become one of the next great scorers in Vancouver. However, while the 19-year-old is 6-foot-2, he weighs in at 161 pounds and the presence of one of those players could remind other teams to stay away from their prized prospect. While the Winnipeg Jets are coming off an exemplary season in which it reached the Western Conference Finals with a young, talented team, now comes the hard part. The team is full of key restricted free agents which could start taking up what was once an ample amount of cap space. The team has already all but said they don’t intend to re-sign trade deadline acquisition Paul Stastny and for good reason. The team must lock up a number of key players, including all-star goaltender Connor Hellebuyck, Adam Lowry, Joel Armia, Marko Dano, Tucker Poolman, Josh Morrissey, Joseph Morrow, and oh, Jacob Trouba. Two years ago, the contract negotiations between Trouba and the Jets went south, as Trouba ended up holding out for an entire month of the season before coming back and signing a below-value two-year bridge deal. Now, with Trouba’s stock sky-high as one of the top defensemen on the team, things could get even more dicey, according to Winnipeg Free Press’ Paul Wiecek. Trouba and his agent are expected to ask for about $7MM per year, while the Jets hope to keep it between $5MM and $6MM. The question is whether the Jets can afford to give him a big, long-term contract, considering that his offense isn’t even close to his defense after posting three goals and just 24 points on the year. The team not only has to lock up these younger players, but must eventually lock up captain Blake Wheeler as well as pay youngster Kyle Connor in one year. The money will start to dry up soon. The scribe suggests the team consider moving Trouba now to save some of that money, considering his value is at a premium. Bringing back a big haul could save the team some cap space and fill some of its holes in one swoop. While there was a rumor mentioned by Pierre LeBrun recently about the St. Louis Blues’ interest in Ilya Kovalchuk, NHL.com reports that general manager Doug Armstrong confirmed the team’s interest in the veteran KHL winger. “There’s certainly intrigue there because he’s been such a dominant player internationally and he was a hell of a player when he left [the NHL],” Armstrong said. Kovalchuk, who has played in Russia for the past five seasons is looking for a new home and has already visited the Los Angeles Kings and San Jose Sharks, while other teams like the Boston Bruins have expressed interest in the 35-year-old veteran, who has tallied 417 goals in 816 NHL games with the Atlanta Thrashers and the New Jersey Devils. 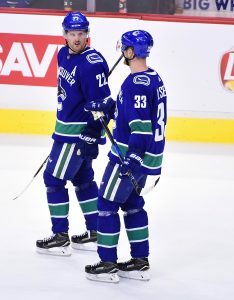 Mike Halford of The Athletic (subscription required) writes that the Vancouver Canucks, who have always been adept at mining organizations to get quality players, need to continue to do that more than ever with the retirement of Daniel Sedin and Henrik Sedin. With a lineup full of holes, the scribe writes that the team needs to continue mining other organizations for their unwanted, forgotten or unfulfilled talent like in previous years. Over the last few years, the team has picked up several key players such as Sven Baertschi, Markus Granlund, Nikolay Goldobin, Derrick Pouliot and Brendan Leipsic. The scribe goes on to point out three players the team should look into during the offseason and pry them away for late picks include Winnipeg’s Nic Petan, Columbus’ Sonny Milano and the New York Islanders’ Michael Dal Colle. All three are on the outside looking in within the organization and might need a franchise to give them a new chance. Although the Stanley Cup playoffs are in full swing with four excellent match-ups in the second round, as teams have been eliminated – and continue to be eliminated – from contention, players begin to make decisions about their futures. 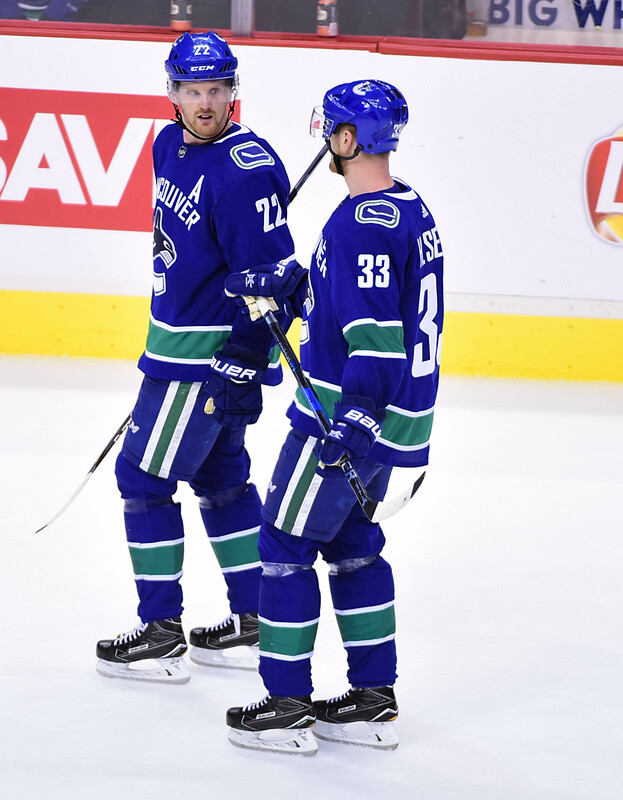 Knowing that they were not playoff-bound, Daniel Sedin and Henrik Sedin announced their departure from the Vancouver Canucks and pro hockey before the end of the season. Former teammate Radim Vrbata made the same decision days later. The Blackhawks’ Patrick Sharp announced that he was moving on, after a return to Chicago didn’t go as planned. Then, Anaheim Ducks defenseman Francois Beauchemin then got the off-season retirement party started last week, officially calling it a career. Meanwhile, for the third straight summer, Matt Cullen will be contemplating his hockey mortality. Who could be next? Jaromir Jagr and Jarome Iginla: Let’s start with the easy ones – a Calgary Flames legend and a legend whose career likely ended with the Calgary Flames. Jagr and Iginla were both pushing hard for a final chance at the NHL last summer and both players continued their searches into the regular season. Jagr finally landed a deal with the Flames in October, but health issues and a lack of productions made for a poor tenure in Calgary. Jagr recorded just seven points in 22 games before heading back to his native Czech Republic in January. Iginla opted to undergo surgery in the fall, but was back skating in February and hoping to sign on with a team for the stretch run and postseason. However, no such offer came. These two have been a couple of the biggest names in hockey since the 1990’s and are surefire Hall of Famers, but there is little doubt that their NHL playing days are behind them. Expect official announcements this summer. Brian Gionta: Gionta is in a similar spot. Unable to find a contract last off-season, Gionta worked out and skated with the AHL’s Rochester Americans ahead of his appearance with Team USA at Winter Olympics. It was a less-than-spectacular showing by the veteran, but he still managed to turn it into a late-season contract with the Boston Bruins. Gionta posted seven points in 20 games with the Bruins in the final months of the regular season, but has yet to see any playoff action, despite ample opportunity given injuries to multiple Boston players heading into and during Round One. Gionta’s play with the Bruins has not exactly harked back to his prime, but nevertheless has shown effort and intelligence. He may have earned another look next season, but it’s more likely than not that this current run with Boston will be the curtain call for Gionta. Chris Kelly: Kelly also played at the Winter Games and signed on late like Gionta. However, both he and his team have not had similar success. Kelly saw just 12 games with the Anaheim Ducks after signing in February and only contributed two points to show for it. The Ducks were then swept out of the playoffs without Kelly having any say in the matter as a healthy scratch all season. Kelly surprised a lot of people when he played in all 82 games with the Ottawa Senators last season, but this short campaign has shown that the years of dependable play have caught up with him. Mike Fisher: Will Fisher re-retire? Almost surely. No one can blame Fisher for not wanting to miss out on a possible Cup run by the Nashville Predators one season after coming so close, but Fisher’s presence on the team thus far has been more about leadership and morale than on-ice impact. Fisher had just four points in 16 games down the stretch while averaging just over twelve minutes of ice time and thus far in the postseason has been held scoreless in seven games while seeing barely eleven minutes of time. Fisher’s days as a legitimate player seem to clearly be over, but he could still make a difference for Nashville in these playoffs with the right opportunity. Dominic Moore: There may be no other player in the game today who has thrived by being a hired gun like Moore. Throughout his career, the veteran center has been able to join a new team, adjust, and play a critical support role. So, when that pattern fell apart this year with the Toronto Maple Leafs, it signaled the coming end to Moore’s career. Moore was common scratch for the Leafs and averaged only about ten minutes of ice time per night, but with twelve points in 50 games, he also didn’t make the most of his opportunities. If any player in the league can adapt to being 38-years-old and coming off a down season by finding the perfect fit for another go-round, it’s Moore, but don’t be surprised if he calls it quits instead. Joel Ward: There’s no doubt that Ward would like to keep playing. A hard-nosed player and a consummate pro, Ward has been a reliable piece to every team he has been on. However, there is no looking past what by all accounts was the worst season of his career in 2017-18. Just twelve points in 52 games and less than twelve minutes of ice time per game shows just how small a role he played for the San Jose Sharks this year and that’s not even including the fact that the Sharks tried to trade him at the deadline and have yet to play him in the postseason. Ward’s time in San Jose is undeniably over, but that doesn’t mean another team can’t take a one-year flier on him. At this point, it seems unlikely though. Dennis Seidenberg and Johnny Oduya: What else do these two 36-year-old, left-shot, physical defenders have in common? Their time has come. Seidenberg’s resurgence with the New York Islander was a great story last season, but he came back to earth in this campaign and was limited by injuries and inability to just 28 games and five points. Oduya has had back-to-back disappointing seasons like that, recording only 17 points in 104 games with four different teams across the past two seasons. Dealt to the Philadelphia Flyers at the deadline, Oduya did nothing, skating in just one regular season game and zero postseason games. Both of these men have been admirable NHLers, but it’s hard to see either continuing to play. On the bubble: Jason Chimera, Antoine Vermette, and Kevin Bieksa, Anaheim Ducks; Josh Gorges, Buffalo Sabres; Matt Stajan, Calgary Flames; Lee Stempniak, Carolina Hurricanes; Ales Hemsky, Montreal Canadiens; Scottie Upshall, St. Louis Blues; Jussi Jokinen, Vancouver Canucks.